The future of Cornwall's working lighthouses could be under threat, because of increasingly sophisticated navigation aids being used by ships. Satellite systems mean that traditional flashing lights around the coast are now less important. 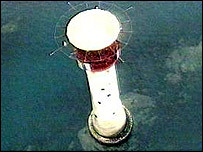 But the lighthouses are not likely to disappear as they can be used as towers for electronic navigation equipment. There are 12 lighthouses around the Cornish coastline including the Wolf Rock, the Longships and the Lizard. The flashing lights have warned mariners of the dangers around the region's treacherous coastline. The lighthouse on the Lizard has protected seafarers from Britain's most southerly point for more than two centuries. But now Trinity House and other lighthouse authorities say they have a decreasing significance and it is possible some could be discontinued. However the lighthouse authorities are also warning that some seamen could be jeopardising their safety by relying too much on satellite systems. Trinity House spokesman Howard Cooper told BBC News Online that satellite systems can be so accurate that mariners - in particular some leisure users - rely on them completely. Mr Cooper said: "Leisure users can become almost too confident because of the accuracy of satellite navigation. "They'll go out at night and in poor visibility because they trust the system. "But satellite systems can fail for whatever reason and by relying totally on one system, mariners could be going into unfamiliar waters." Mr Cooper says a new system is being designed which is a mix of satellite and radio navigation. He believes seafarers need a healthy knowledge of the Cornish coastline and where the lighthouses are. He says to navigate safely, boat users should use a combination of aids, from satellite navigation to buoys, beacons and lighthouses.